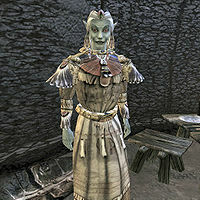 Sinnammu Mirpal is the Wise Woman of the Ahemmusa Tribe of Ashlanders, who can be found in her Yurt at their camp in the northeast Grazelands. Since the Ahemmusa Tribe currently lacks an Ashkhan, she is the de facto leader of the tribe, which is currently seeking a new place to call home. Esta página foi modificada pela última vez à(s) 22h40min de 15 de janeiro de 2016.